To celebrate our return to the ‘Alien’ universe with Ridley Scott’s sort-of-prequel ‘Prometheus’, which opens in theaters tomorrow, Titan Books has reprinted a pair of books that take us deeper into the franchise. The first, simply titled ‘The Book of Alien’, is a terrific look at the production from a design and construction standpoint. 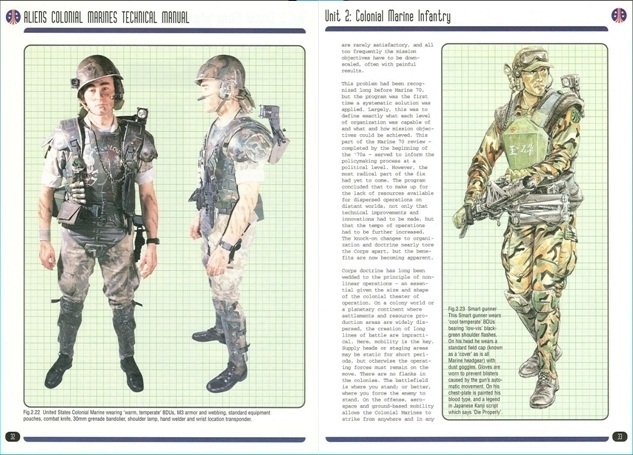 The second, ‘Aliens: Colonial Marines Technical Manual’, is a highly-detailed peek at the military gear seen throughout the sequel. ‘The Book of Alien’ by Paul Scanlon and Michael Gross was originally published in 1979. It features an amazing collection of illustrations and concept art. 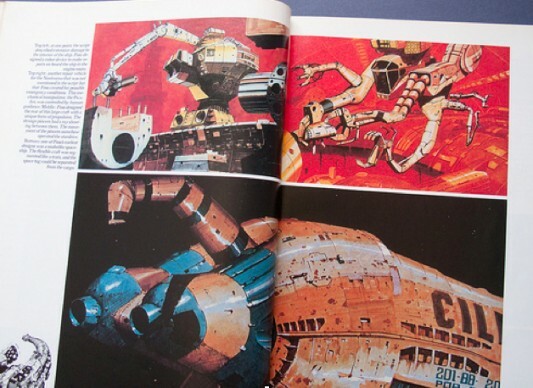 Starting with some very early artwork of the refinery spaceships that transport the humans in the film, the authors explain how Ron Cobb and Chris Foss initially became involved with the project. Their sketches are meticulous and painstakingly thorough, with wildly imaginative ideas that surely would have costs the producers a pretty penny. When Ridley Scott joined the team late in the pre-visualization stage, his own visual ideas grounded several ingenious concepts by Cobb and Foss. Looking back at them today, it’s a shame that the artists’ drawings couldn’t have been used in some form or another. The next phase in the film’s production was transforming the pieces that Scott liked best from concept art into a functional reality. That’s where art director Roger Christian, and his team of set designers headed by Michael Seymour, came in. They took many of Cobb’s ideas and turned them into real three-dimensional spaces. The same type of process went into the making of the costumes by John Mollo, except that Mollo took much of his inspiration from sketches by Jean “Moebius” Giraud. When it came time for the construction of H.R. Giger’s dark ideas and creature design, the team had to put a bit more work into it, but remained just as concerned with the smallest details. Also pictured in the book are several of Giger’s art pieces, a couple of which were discarded at the last minute by Scott, such as a mural of the alien creature’s life cycle. The authors share various anecdotes from cast and crew interviews in between the hundreds of drawings and production stills. All of this demonstrates the extensive amount of work and effort that went into the making of ‘Alien’. The second book comes from Lee Brimmicombe-Wood and was originally published in 1996. The ‘Aliens: Colonial Marines Technical Manual’ lives up to its title by reading much like an official technical manual for new recruits into the United States Colonial Marines Corps (USCM). Totaling 159 pages, the book is broken into seven units that cover many areas of the military force seen in James Cameron’s ‘Aliens’, starting with a very brief history of the organization and the meaning of a few badges. I find it funny that the author actually specifies 2179 as the year that the manual was written, since that’s supposed to be the year that Ripley returns to the alien planet with the Marines in tow. (Logically, the manual should have been published earlier.) It’s a small nitpick, easily forgiven once we dig deeper into the book. The manual provides a remarkably detailed breakdown of the USCM, which may make it one of the most imaginatively exhaustive books to accompany one specific aspect of a film’s plot. After the intro, we take a closer look at the infantry, their gear and weapons – especially the M56 Smart Gun that Private Vasquez handles extraordinarily well. Best of all are several pages dedicated to descriptions of the tactical formations and movements of the Marines. Then there’s an entire section just on the armor and other heavy weapons, along with more explanations about the other forms of support and military operations. The last chapter is an interesting way to lead the reader into the movie with transcripts and other relevant information of the first film. In the end, both books make worthwhile additions to any fan’s collection of ‘Alien’ memorabilia. One allows you to learn more about the concept and production design of Ridley Scott’s sci-fi horror masterpiece, while the other takes an ind-depth look at the gear, weapons and infantry tactics of the Colonial Marines who invade James Cameron’s spectacular follow-up. Photo stills of costumes and props help tremendously to visualize the intentionally dry and straightforward writing in Brimmicombe-Wood’s book. By contrast, Scanlon and Gross’s ‘The Book of Alien’ is more of a collection of concept art and illustrations with anecdotes taken from interviews. Whichever you choose, you can’t go wrong with these wonderful books. I can easily recommend purchasing both as excellent reads to prepare for Ridley Scott’s ‘Prometheus’. ‘The Book of Alien‘ and the ‘Aliens: Colonial Marines Technical Manual‘ are currently only $10.49 and $11.49 respectively on Amazon. Thanks for the writeup on both books. For other movies and TV shows, I do have a few concept-art, making-of books as well as technical-manual books. Both of these look interesting. I’m not quite sold just yet, but at least now they’re on my radar so that I can check them out.